June 22, 2016, Westminster, CO – TransMagic, Inc., a leader in CAD data translation, geometry repair and model validation announced the new generation of 3D CAD productivity solutions, now available in Release 12. The focal point of the release is the easy handling of complex annotations in any 3D format for Model Based Definition (MBD) and Product Manufacturing Information (PMI). The new capabilities can save time and prevent errors in manufacturing and quality checking. The advancements in R12 were achieved through collaboration with major aerospace and automotive customers; this was done to streamline a broad range of detailed manual processes that rely on access to design annotations and instructions to increase productivity. Also in this release, TransMagic has updated CAD version support for all major formats, added new lightweight formats that simplify design communication with customers and suppliers, and updated support for hybrid CATIA files. New additions to the product include technical document publishing in 3D PDF, multiple new rendering modes and language support. 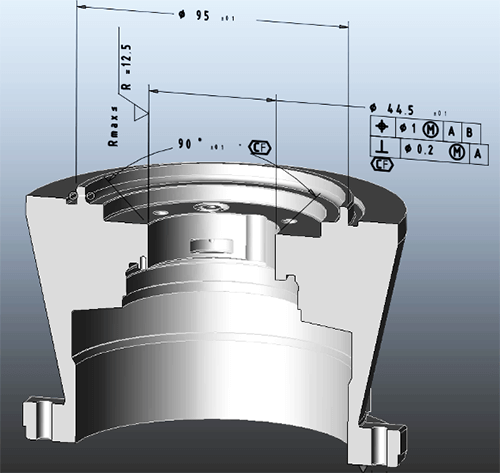 TransMagic has expanded PMI (Product Manufacturing Information) and MBD capabilities to support annotated section views. All annotated views are indexed for rapid access in the new PMI View Browser. These views make it easy to find specific callouts. The PMI views can be saved out to 3D PDF or MS Excel formats with a single click and used to streamline quality control and shop floor operations that rely on precise tolerances and work instructions. TransMagic’s new Tech Docs functionality is designed to facilitate the creation of 3D PDF technical documents and reports containing 3D models. TransMagic Tech Docs can embed documents, spreadsheets and multiple CAD files in a 3D PDF file to create a complete technical data package that is useful for quality inspection reports, archival documentation, tool usage instructions, electronic work orders and much more. TransMagic R12 supports the latest versions of all major CAD formats, including CATIA, Siemens NX, Creo, Solid Edge, SolidWorks, Inventor, JT, Parasolid and more. TransMagic added support for 3DXML and WebGL formats. WebGL is an exciting file format that can be opened with any browser. Powerful and lightweight, WebGL can support MBD, redlines and notes. Anyone can view WebGL files on a PC, phone or tablet, making it an ideal 3D communication format. R12 will now open hybrid CATIA files, which are a combination of true CAD geometry plus polygonal (CGR) geometry. TransMagIc R12 supports external referenced (xref) files in the STEP file format. The new Polygon Reduction Tool provides a quick and intuitive way to reduce the number of facets in complex CAD or polygonal models (such as STL and OBJ), while retaining a high quality polygonal mesh. This function was developed for our rapid prototyping and robotics automation customers where file size restrictions are common. Upon launch, TransMagic will start in the local language set on the user’s PC. With the addition of Chinese and Korean in R12, TransMagic now supports 8 languages including English, Spanish, French, Portuguese, Japanese and German. TransMagic, Inc. develops 3D CAD data exchange, geometry repair and validation software for the manufacturing industry. TransMagic offers scalable solutions ranging from desktop applications to enterprise systems with PLM integration. TransMagic supports 3D data operations between CAD/CAM/CAE applications for analysis, manufacturing simulation, visualization and more. 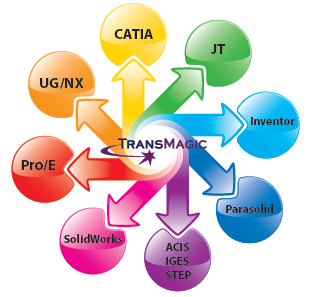 TransMagic’s customers include ABB, Boeing, Caterpillar, Chrysler, Fanuc, GE, Honda, Lockheed Martin, NASA, Northrup Grumman and Siemens. For more information, please visit www.TransMagic.com or call +1 303.460.1406. Brad Strong, Technical Communication Manager, TransMagic, Inc.